This page allows you to see how the sky is scrolling past our camera during an observation. By clicking on any of the run/camcol combinations, you can watch the sky at a resolution of approximately 1 arcseconds per pixel. You can stop the scrolling any time, by clicking on the small stop sign below the SDSS icon in the top left of the page (this may take a few seconds to respond). The images from the SDSS project are organized into stripes. These are long images, 24,000 pixels wide (2.5 degrees), and typically over 1 million pixels long (120 degrees). The SDSS covers the northern sky with 45 overlapping stripes. 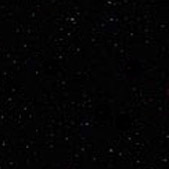 The stripes try to avoid the dust in the plane of the Milky Way, as shown by the red areas on the celestial sphere to the right. Each stripe is merged from two runs, taken on separate nights. The telescope can complete only a single run in any given night: it takes about 8 hours to complete one. Each run consists of 6 camcols (camera columns), one corresponds to each array of CCD detectors of our camera. Each camcol takes images in five colors.